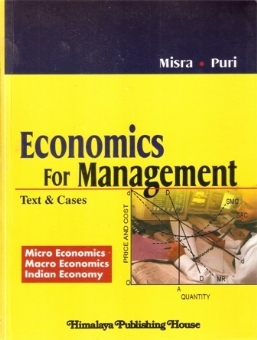 The present book Economics for Management has been prepared keeping in view the requirement of the MBA students of various Universities. It discusses the principle of microeconomics and macroeconomics in detail. The discussion has been divided into four modules: Module 1 on 'Introduction' consists of three chapters explaining the basic concepts of business economics and the fundamentals for demand including cardinal and cardinal and ordinal utility approach, revealed preference theory, elasticity of demand, recent developments in the theory of demand, etc. Module 2 on 'Theory of Production and Cost' consists of three chapters devoted to the discussion of the laws of production, isoquants, returns to scale and various cost concepts (including a discussion on recent developments in the theory of cost, engineering cost curves, shapes of cost curves and decision making ets.) Module 3 on 'Theory of Firm' is the largest module consisting of nine chapters spread over almost 200 pages. In addition to a discussion of price determination under various market forms (perfect competition, monopolistic competition and oligopoly), this module also takes up for discussion the marginality controversy, average cost pricing limit pricing, managerial theories of the firm and behavioral theories of the firm. Module 4 on ‘Macroeconomic Analysis' discusses the various concepts used in macroeconomics, national income accounting, determination of equilibrium level of national income and output theory of multiplier, IS-LM analysis, supply side economics, unemployment and inflation. All difficult have been explained in a clear and concise maimed and important statements have been highlighted separately in shaded boxes for the benefit of students. Conceived thus, we hope that the book will prove to be immensely useful for the students of MBA of various Universities across the country. We also hope that it will come up to the expectations of the teachers.